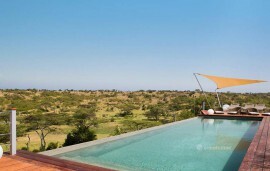 This uniquely situated luxury camp on the banks of the Talek River overlooks the mottled plains of the Maasai Mara, where vast herds of wildlife co-exist with the colourful Maasai people between June and October the Maasai Mara plays host to one of the most spectacular wildlife shows on earth the great annual migration of over a million wildebeest and zebra as they enter the Mara ecosystem from Serengeti in neighbouring Tanzania. Tipilikwani’s tents enjoy river frontage and are decorated with warm, rich Maasai colours. The camp provides access to free and clean water from its borehole to the neighbouring community, which has resulted in elimination of typhoid fever. 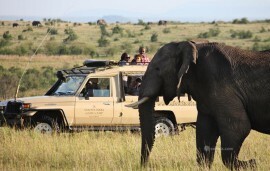 Tipilikwani Mara Camp offers twenty luxurious tents by the riverfront two of which are adjoined family tents. Between the two family tents; one contains a king-sized bed while the other has two queen-sized twin beds. The non-family tents are categorized as such; four of the tents have king-sized double beds while the rest contain queen-sized beds. All bathrooms at the camp are equipped with stand alone bathtubs. Tipilikwani camp also offers a lounge and dining area which offer vibrant safari colors, decorated with original oil paintings and set in soft intimate lighting designed to give guests the ultimate relaxed ambience.